G-man made supper tonight. Seriously, all I did was chop up the potatoes and carrots, slice a few rings off an onion and measure out milk. He put it all in the pot. We turned on the heat, gave it an occasional stir and enjoyed homemade potato soup in less than an hour. No roux, no cream, no fuss. Thinly slice three of the potatoes and coarsely cube the rest. The thin slices will dissolve, thickening the soup. Put all ingredients in a pot and turn on the heat. Leave the lid off the pot and stir the soup as it comes to a boil. Reduce the heat and stir occasionally until the larger chunks of potato are rounded and start to fall apart. Turn off the heat for a few minutes and serve. I shared this at Sunday Night Soup Night, Gluten Free Wednesday , Healthy 2day Wednesday, Real Food Wednesday, and Full Plate Thursday, Simple Lives Thursday and the Ultimate Recipe Swap. This sounds amazing! Do you think if I used unsweetend Almond milk it would be ok? Does it matter what kind of milk skim, 2% etc? Thanks for posting! Thank you! We used 2% because we had it on hand. Whole will make a creamier soup and skim somewhat thinner. Have you cooked with almond milk before? Does it reduce? 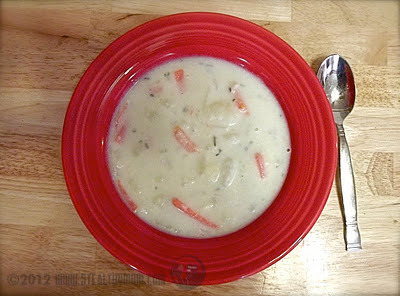 We love Potato Soup and your healthy recipe looks delicious! I am grateful for you and your family that Stealthy Dad is doing well, and your healthy cooking will sure help him and your children. Thank you so much for sharing with Full Plate Thursday. Hope you are having a great week end and come back soon! That sounds delicious - I've never made milk-based (as opposed to broth-based) potato soup before. THanks for sharing at Healthy 2Day Wednesday! I make a similar recipe that my my family loves. Thanks for sharing this at Gluten-Free Wednesdays. Hey! We have to eat gluten free and EASY always catches my eye. Thanks for this recipe! What a wonderful, hearty soup! I love easy, no fuss soups :) Thanks for sharing this with Sunday Night Soup Night, look forward to seeing you again soon! i actually have some blanched potatoes in the fridge waiting to be used.. may add the blanched celeriac as well :) thanks for the inspiration!